As a wholly owned subsidiary of China’s CNOOC, Nexen Energy struggled with audits from external auditors and business stakeholders. Operating in a heavily regulated industry, governance, risk, and compliance is a top priority. 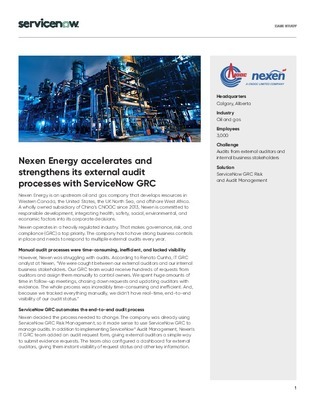 Find out how they were able to implement ServiceNow GRC to make a sustainable, agile, and transparent audit process and handle two major ‘Big Four’ audits at the same time.